The Nigerian Army on Wednesday said its troops killed four would-be suicide bombers near a checkpoint on the outskirt of Maiduguri, the capital of Borno State. 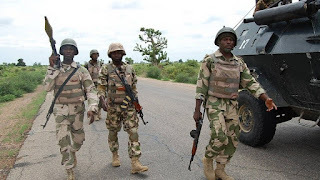 A statement by the spokesman of the Nigerian Army, Sani Usman, said one of the four female bombers died when she detonated her explosive vest, while the three others were gunned down by the troops. “Today at about 7.30am 4 female suicide bombers were intercepted by troops and Borno youth, otherwise known as Civilian JTF, ahead of a checkpoint, which is about 25km away from the city of Maiduguri. “The security situation in the area is now cool and calm,” Mr. Usman, a colonel, said.